Home » Appitizer » GRILLED CHEESE PLEASE! Is there anything more satisfying on a cold and rainy fall/winter/icky weather day than an ooey gooey grilled cheese sandwich and a bowl of tomato soup into which you can dunk it??? While I know some may disagree with these choices of comfort food I stand by my choice of I’m cold, I’m wet, feed me now menu. I hope you realize that I was posing a rhetorical question so please work with me here and withhold any and all votes on your passion for peanut butter and jelly and a glass of milk or craving corned beef with a side of coleslaw as your go to #1 comfort food. I’ve long been a fan of using different kinds of cheeses in my culinary masterpieces and encourage everyone to be bold and try anything and everything that melts (except blue cheese, I REALLY don’t like blue cheeses and well, they’re blue and eating anything blue other than blueberries is just a no no in my book). There are so many new and wonderful varieties of kosher cheeses available so that once you try Pepper Jack, Gruyere or Havarti (or even flavored goat cheese) on your bread of choice you’ll never go back to those generic yellow and/or white slices of what passes for cheese in the bulk section of the grocery. I’m going to suggest that Challah or Italian breads are the best go to choices for your bread base. You can, of course, use a heartier whole grain or rye to build your meal but make sure that the cheese you pair with them can stand up to their bolder flavors. You can also opt for French bread if you want to make smaller, open face sandwiches (they are great as appetizers with tomato soup shooters). 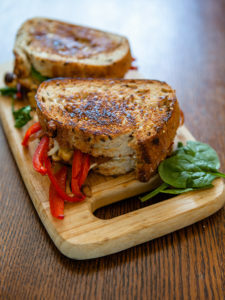 Adding grilled vegetables like peppers, mushrooms or kale and spinach to your sandwiches adds a bit of crunch and a whole lot of extra flavor. 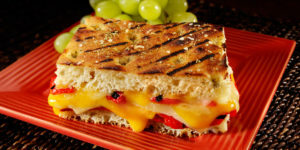 If you are making a lot of sandwiches for a big crowd under cook them slightly, preheat an oven to 350, place them on a cookie sheet with sides (this also works if you are having a hard time getting the cheese to melt,) and pop them in the oven for 2 to 3 minutes to crisp them up and melt the cheese. Preheat the oven to 275. Line a cookie sheet with sides with parchment paper. Arrange the tomato quarters on the paper. Add the minced garlic and mix to combine. Drizzle the 1/4 cup of olive oil over the top and gently mix to coat. Season with salt and pepper. Place on the thyme sprigs around the tomatoes on the pan. Bake in the oven for 2 ½ to 3. While the tomatoes are roasting sauté the onions in a sauce pan in 1 tablespoon of olive oil and brown sugar. When they are lightly golden remove from heat and set aside. When the tomatoes and garlic are done add them to the sautéed onions. Mix to combine and add broth, vinegar and ketchup. 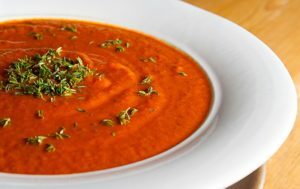 Using an immersion blender or regular blender puree the soup. Season with salt and pepper as needed, heat to a simmer and serve with garnish if you like. Serves 6 to 8. In a skillet melt 1 1/2 tablespoon butter and olive oil. Add the onions ad 1 teaspoon thyme and 1 teaspoon rosemary. Cook, stirring constantly until the onions are soft and starting to turn golden (8 to 10 minutes). Add the honey, mix to combine and continue cooking for 1 minute. Remove from the onions from the pan (place them in a bowl) and set the skillet aside but don’t clean it. In a skillet melt the butter. Add 1/2 of the butter. Place the pita in the pan and top with you cheese of choice, then the spinach and top with the tomato slices and a little salt and pepper to taste. Sprinkle a little extra cheese on top of the tomato. Cook for 1 minute then place the other pita on top of the sandwich in the pan. Press down slightly. Using a spatula, remove the pita from the pan, melt the remaining butter and then flip the sandwich and cook until the cheese is melted, 2 to 3 more minutes. Remove from pan, place on a plate, cut in half and serve. Serves 2 or 1 REALLY hungry person. In a bowl combine the basil, melted butter with the olive oil, mix and set aside. Spread about 1/2 tablespoons of sauce on each slice of bread. Top 4 of the slices with the sliced mushrooms and then cover them with the slices of cheese. Sprinkle the dried oregano over the cheese. Top with the remaining slices of bread, sauce side on top of the cheese. Heat a skillet. Brush top of the sandwich with the olive oil/butter mixture and place it oiled side down in the hot pan. Cook for 2 minutes or until the bread starts to brown. Brush the remaining butter oil mixture on the top of the sandwich, flip and cook until the bread is browned. Remove from heat and serve immediately. Serves 4.